All Duct Fabrications Pty Ltd has been involved in the design and manufacture of Free Field Test Rooms, Audio-Metric Test Booths, Sound Studios, Industrial Enclosures, Ovens and various other Noise Control Products for some twenty years. Having in that time manufactured and installed rooms, booths, studios etc in all states of Australia and venturing into the overseas market, in both supply and installation, as far afield as Cairo, Budapest, Singapore, Korea, Geneva and the USA. One of our most recent successes being the manufacture of Exhaust and Supply Air Attenuators for Transurbans City Link Project in Melbourne. 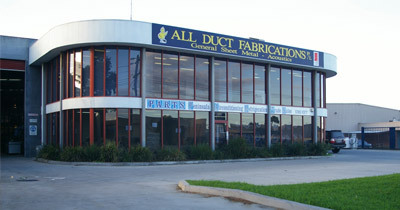 All Duct Fabrications Pty Ltd is a privately owned Australian Company specialising in the manufacture, fabrication and installation of free standing audio-metric rooms, sound studio's acoustic enclosures, air conditioning ducting and general sheet metal fabrication to customers specifications. The equipment, technology and facilities available in our sheet metal fabrication division and the expertise of our staff, enable us to fabricate anything you require out of steel...whether its flashing, ducting, kitchen exhaust canopies and stillages. We can work to your specifications, or offer advise to ensure your finished product is the most efficient and cost effective possible. Additional services provided at All Duct Fabrications Pty Ltd include welding and computerised plasma cutting. We offer a complete welding service, including MIG, TIG, OXY and electric ARC, which can be provided either in our factory or on-site. Our computerised plasma cutting facilities enable us to cut any shape to 6mm, up to 3 metres x 1.5 metres. For details please enquire. If you require a sound studio or acoustic enclosure but you're not quite sure how to go about it, we can assist you, as we provide a full design, manufacture and installation service. We can either work to your plans and specifications or as we have available the services of a qualified engineers, we can design a system for you based on your concept. The versatility and expertise of our staff, and the technology we have available, enables us to offer a diverse range of products and services... from the design, manufacture and installation of new and replacement air conditioning ducting and water towers, to the design and installation of process water systems. And as we are quality accredited to international standard ISO9001, we are committed to offering our clients the highest standards of products, workmanship and service. © 2011 All Duct Fabrications. All rights reserved.